These country classic song lyrics are the property of the respective artist, authors and labels, they are intended solely for educational purposes and private study only. The chords provided are my interpretation and their accuracy is not guaranteed. Jack Greene lyrics are intended for your personal use only, he's a fabulous entertainer with great country songs. Use these classic country song lyrics with chords to help keep our music alive. 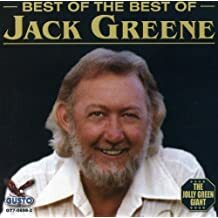 Jack Greene has given us so much great music over the years and what a talent he is. It's such a pleasure to play and sing his songs especially the ones that have been forgotten and never played anymore. Jack formed his own band in the early years of 1950 while living in Atlanta, Georgia. He moved back to Tennessee, his home state, settling in Nashville and there he was asked to open a concert for Ernest Tubb, naturally Mr.Tubbs recognized his talent and asked him to join his band. Jack was with the ET band for several years and with the encouragement of Ernest he pursued a solo career and was an immediate success. "There Goes My Everything" became a monster hit staying on top of the country charts for seven weeks. Many hits followed and one that will always be special to us is "You Are My Treasure". We will forever be grateful to Jack Greene for the country music he gives us.